The Series 3470 single stage regulators are specifically designed and constructed for use with difficult to handle gases, such as chlorine and hydrogen chloride. The large monel nozzle and PCTFE® seat combined with the tied diaphragm assembly greatly reduces the possibility of failure due to creep so common in other corrosive gas regulators. A Teflon-lining on the stainless steel diaphragm forms a protective coating to extend regulator life. The electroless nickel-plated brass body is a major contributor to the economical nature of this regulator while providing corrosion protection. Four built-in PCTFE seats provide convenient maintenance and long regulator life. Large Teflon® lined 316L stainless steel diaphragm. Monel valve with Teflon packing installed on outlet. Captured vent bonnet provides for save venting in the event of a diaphragm failure. 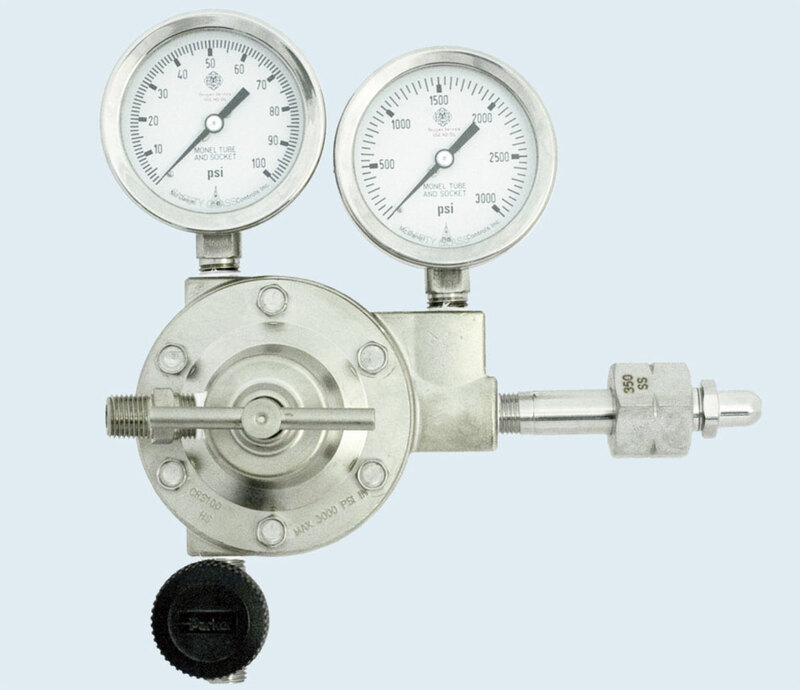 The 3470 Series regulators are ideal for use with many corrosive gases, such as chlorine, hydrogen chloride, boron trichloride, and boron triflouride. They are also useful for controlling the pressure of high concentration gas mixtures containing these corrosive gas components. NOTE: See pages 130-146 for gas data and equipment recommendations. Operating Temp. Range: -40° to +185°F. *Specify CGA Connection Number when ordering. WARNING: A Purge assembly (see pages 96 and 97) is strongly suggested when using the above regulators with any corrosive gas.